We have that and more in Friday’s NBA newsletter. The starters for the 2019 NBA All-Star Game were announced Thursday night, with perhaps only one surprise — Paul George edging Anthony Davis for the third West frontcourt spot. The full vote breakdown is interesting. Thankfully, fan vote favorites Derrick Rose (ugh), Dwyane Wade, and Luka Doncic could not overcome reason or the media and player vote to steal starting slots. The NBA’s new vote system is working. But now it’s time to prepare for the All-Star draft LeBron James and Giannis Antetokounmpo will hold on February 7. They’ll pick from the pool of starters first, then select their reserves. Since we only know the starters for now, let’s mock. Kawhi just threw down several million on a house in SoCal. LeBron’s a smart dude. Bring Kawhi home. Curry was a captain last season and picked Giannis, likely first overall. (The draft was secret last year. It’s televised this season.) Giannis never forgets. You know what’s funny? Four of the 10 All-Star starters will be free agents in July. You know who has gobs of cap space? The Lakers. You know who has clearly always wanted to be his team’s GM and now effectively gets that chance via All-Star diplomacy? LeBron James. Remember how seriously Giannis has taken the All-Star Game in the past? I imagine him taking the draft that seriously, showing up with binders and wearing eyeglasses. Harden is a good pick here. All-Star. Diplomacy. Plus, there’s no way LeBron is picking Paul George after being snubbed last summer. Giannis has no such qualms. Can you imagine a defense starring Giannis and PG-13? Yikes. … that means Joel Embiid is the last pick among starters, which he will absolutely take personally. This will get him mad at LeBron, and by extension mad at Ben Simmons, who shares an agent and friendship with King James. 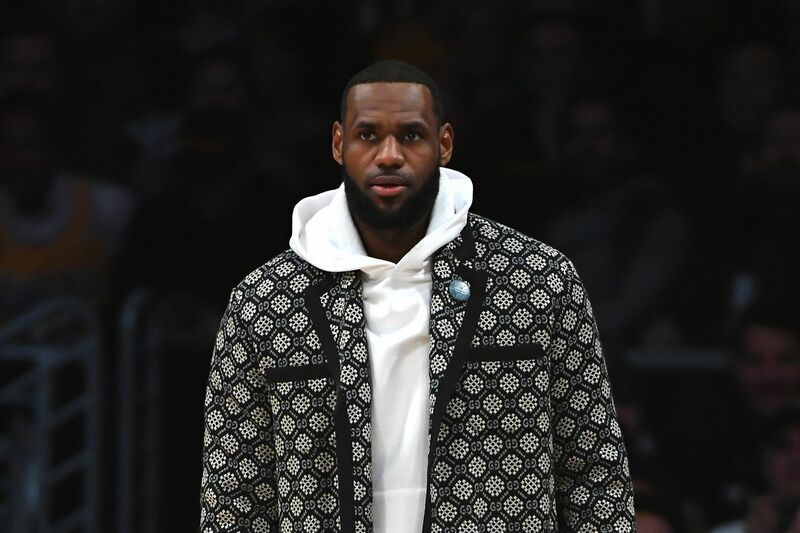 Oh wow look LEBRON JUST DESTROYED THE SIXERS. All in a day’s work. Executive of the Year. Here’s the full weekend schedule. Big TV games include Rockets-Raptors on ESPN Friday, Warriors-Celtics on ABC Saturday, and Bucks-Thunder on ESPN Sunday. Victor Oladipo is out for the season with a torn quad tendon. What a huge bummer all around for a good, fun player and a good, fun team. Indiana will probably also now get shut out of All-Star Weekend. Here’s Dan Devine on how the Pacers will respond now. The Pacers rallied to win the game Oladipo left on a stretcher. Players tell Matt Ellentuck why that’s so hard. The full story on Kevin Durant’s good works in D.C.
An argument that the Suns should accelerate their rebuild by trading for Mike Conley. How Semi Ojeleye got so jacked. ALL-STAR JERSEYS! Nice honeycomb nod to Charlotte. Stephen Curry remains unafraid to get political. Meanwhile, the Warriors’ players visited Barack Obama while in D.C. to play the Wizards. The visit was supposed to be a secret, but the team security manager posted it to Instagram and it got snooped before being deleted. The story of Luka Doncic’s secret workout with Stephen Curry. It is unclear why this needed to be secret? How Donovan Mitchell overcame the sophomore slump. How Rajon Rondo’s return helps the Lakers. Explaining this incredible P.J. Tucker blunder. Indiana University has one season with its superstar freshman Romeo Langford, and the Hoosiers are wasting it. I used to *really* like Weezer. I still listen to some of it. I’m a less militant Leslie Jones. Here’s my official position on the covers album: if it gets one person in the right demographic to listen to a Weezer covers album who also has no experience with TLC to listen to some actual TLC, it’s a net good for society.